If you’re at all the type of rah-rah planner that falls into the challenge-accepting, penny pinching, empowered-by-internet category (oh, it me), your wedding DIY list probably started out with good intentions. But even the best plans (save money! Make something personal and unique!) can snowball into a time-sucking mental and emotional pressure hole, fast. Before you know it, you’re covered in red dye in your backyard the week before the wedding, hand-dying three hundred ombre dinner napkins, sobbing about how half of them aren’t coming out properly; running on barely any sleep after flower-arranging, food-making, and favor-packing; and wondering why you’re a masochist. Self-care time-out. The key to a healthy relationship with your wedding DIY list? Picking your damn battles. That means ignoring that little voice in your head that’s like, “Natalie, we could totally just make our own farmhouse tables out of, like, recycled wood and stuff, nbd, plus a balloon arch and a five-course dinner.” You know that voice. That voice can be a toxic, unrealistic little self-demon because it can skew your sense of value, letting you get wrapped up in the hefty monetary cost of all things weddings, and start to dismiss the value of your time and, you know, sanity. Fortunately for you (and your sanity), I’ve put together a list below of projects you should and should not DIY. But first, let’s talk about how to figure out what’s worth DIYing in the first place. Think through your cost-benefit equation. Sure, you could make your own farmhouse tables. (We believe in you!) But what does the pro-con spreadsheet look like? Cost of materials, time it takes to make them (a lot), stress, margin for error, transportation logistics versus renting farmhouse tables versus just getting standard tables and finding some other way to get that rustic farmhouse vibe? Maybe farmhouse tables are your number one wedding-vision priority, and no one in your area rents them. Then hell, yeah, make yourself some farmhouse tables and godspeed. In that case the value of the DIY is higher than the value of the time spent making them. Voila: the magic of the subjective value. Some other good rules to abide: Don’t do all the things. And only do one, if any, BIG wedding DIY thing (like food or flowers). Enlist help, always. Be flexible (and ready to abandon projects if you need to). Prepare yourself for mistakes (cost-wise, time-wise, and emotions-wise). Have Plan B’s. Check in with yourself regularly to rerun those subjective value numbers. Because everyone’s cost-benefit/subjective value numbers look a little different, I can’t tell you for sure whether it’s a good idea to tackle those home-embossed invitations or that full-on dessert bar spread. In the end, it’s what your mind, schedule, heart, and wallet—all together—can handle doing with (or without). If like most of us, you are hoping to save a little money, only have moderate to average creative and crafting abilities, and get really excited about the ideas of things, but really, really like not being stressed, here are the places to spend your time (and money) DIYing and the places to… not. When To DIY: You’ve got some passable basic graphic design skills (or killer engagement photos you want an excuse to use!) and couldn’t care less about pricey, heavy paper stocks or extra embellishments like metallics and embossing. Whipping up your own file and using an online printer to pump out postcard-size pieces could cost you less than $20 per hundred cards. In that case, start here! When Not To DIY: You’ve got your heart set on laser-cutting, engraving, or gorgeously illustrated custom portraits (or those fancy hand-drawn maps); custom envelope liners; matching insert materials; and heavy, specialty envelope and paper stocks. While a lot of those elements can be DIYed, you’ll need a good amount of tools and materials that could end up getting pricey, not to mention the stress of mistakes. Unless you’re a stationery pro, we’d leave this to the experts and factor it into the budget. When To DIY: Your event is at a private estate or venue with lax liquor license rules, you’re doing a really small, dinner party–size wedding, or you’re okay with a low-maintenance vibe of wines and beer kegs and have friends lined up that can pick up and ice down the goods. (Or you really want to save money, and you’re fine with keeping it simple.) In that case, start here! When Not To DIY: You’re a craft cocktail connoisseur. Premixing and chilling concoctions can’t be done too far in advance (especially if there are bubbles involved), and messing with giant tubs of punch for a hundred mouths at your venue thirty minutes before your wedding is probably not something you want to deal with. If you can find a bartender enthusiast pal (or pals, on shifts!) willing and excited to spend time away from the party slinging drinks, then by all means. But, we’d probably just go with a bartender. Not only will they have experience serving booze and cutting people off (and hopefully a liquor license! ), they’ll handle the mixers, the glassware, the cleanup, the chilling, and the garnishing. Phew. When To DIY: It’s the only thing you’re doing yourself, and you have a special, sentimental reason to be committed to this wedding DIY—like cooking is your big hobby, or you want to tackle all your family recipes with your family at your side for the family-est event of the year. You’ve done a big-scale dinner or meal catering project before. Oh, and you have help. A lot of it. In that case, start here! When Not To DIY: Pretty much most of the time. Caterers are the bomb, people, plus they’ll handle cleanup (yassss). If you’re feeling anxious about costs or the typical, ultra-formal brand of catered, plated wedding meals, know that there are lots of ways to switch up the eats that don’t involve committing your soul to an onerous DIY. You could do a dessert-only reception, a breakfast one (they’re usually cheaper), more casual food stations, or cocktail-party style foods. Or your favorite food truck! (Though keep in mind that food trucks are semi-DIY, in that you’ll likely need to provide tables, chairs, dishes, and trash pickup.) More on that in the #APWplanner. When To DIY: First up, if you’re in a traditional wedding venue, you might not even have to worry about lighting, but if you do, DIY if you’re fine with something simple and rustic, like bistro strings hung across a lawn, or twinkly lights wrapped around a column. You know your electrical situation can handle it, aka you aren’t in the middle of the field, you won’t need a generator, or the house you’re renting for the night won’t short-circuit on all those light strings. Your venue has a primary source of light for functionality and, you know, guests seeing their plates and where they step (overheads, it’s a daytime event, etc.). When Not To DIY: You want to do something elaborate, like those cathedral-style light tiers in a tent. Your light heights involve anything higher than a standard ladder. You do not have a primary light source. You need a generator. You’re already working with a rentals company who could just wrap it into their duties with a reasonable cost addition. When To DIY: Those magic words again: You’re into the simple and rustic look. You’re not picky about specific blooms, colors, styles, or looks; and you are flexible. (I’ve always loved the hack of trading in bouquets for single proteas tied with a ribbon. They’re cheaper, require almost no flower-arranging skills, and are super sturdy, meaning they’ll last, can be bought a bit more in advance, and you won’t have to worry as much about wilting or misting constantly.) You haven’t fallen absolutely in love with the elaborate creations on Pinterest (stop looking!). You have a few people on your team. You’re not attempting to do many other Wedding DIY projects (trust us on this one). In that case, start here! When Not To DIY: You’re specific about what you want, you really want fragile wedding flowers (hi, hydrangeas and peonies), or you want to spend the day before and of your wedding pampering yourself, drinking champagne with your peeps, getting ready, and not, like, arranging flowers on guest tables. When To DIY: Okay, so here, we’re really talking DIYing the cake experience, not actually baking, decorating, and transporting your own classic wedding cake. Because that’s seriously next level. If you have pastry chef-ing experience and it’s your only wedding DIY (sound familiar? ), though, go for it! For the rest of us, consider DIYing your cake bar if you want variety and you have a bunch of favorite bakeries around town that have delicious off-the-shelf (does that phrase still work for cakes?) cakes that you can make into an amazing mini cake bar. 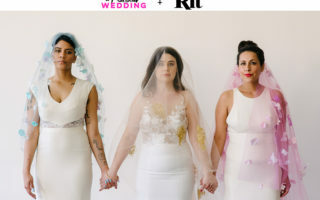 (Can you tell I love this idea and did it at my own wedding?) If all you want is a small tiered cake for cutting, you can get one for thirty bucks at the grocery store or Sam’s Club and add it to the Cake Buffet. In that case, start here! When Not To DIY: You must have a classic, gorgeous wedding cake, with tiers—or, things like sugar flowers and elaborate pastry-chef-ery—and you’re okay spending the dough on it. When To DIY: You have a very special, specific idea in mind that you will have fun making with or without friends and family, and you really want to share it with your guests. For my wedding, we had mini bottles of home-infused vanilla whiskey. Infusing whiskey is super easy, incidentally, and we are both major whiskey fans. Plus, those damn mini bottles were cute AF on the tables. When To DIY: You are a playlist-making master with seriously strong opinions about exactly what music gets played. You’re not necessarily looking for your crowd to get Pumped Up on a dance floor (unless you’re ready to lead the charge on the dance floor and really know what you love to dance to). But for normal humans, choosing music as your wedding DIY is great when you’re looking for more of a background mood music or party vibe, maybe with some people dancing. Essentially, it’s not going to break your heart if it doesn’t turn into the disco of the century. You have a friend who can reliably push buttons at the right time during a ceremony. In other words: music isn’t at the very top of your priority list, so you’re not looking to spend a huge amount of your budget on a couple-thousand-dollar DJ. Renting equipment—which you should definitely do even if you aren’t getting a DJ to handle things, if your wedding has more than twenty people present—costs a fraction (literally, like one-tenth!) of the cost of a DJ. In that case, start here! When Not To DIY: You want an epic-AF dance party and you don’t think you can pull that off by sheer force of will never stopping dancing. Because here’s the thing about DJs: They read crowds, they gauge moods and Pumped Up levels, and they play music to work with that. If you’re really concerned about not playing any Bruno Mars (pleeeeease), you can give them a no-play list. If you must hear Britney (obv), give them a must-play list. Other benefits include that you don’t have to worry about off-timed music during the processional, and you probably won’t have to worry about getting microphones or audio equipment during the vows. They cost a pretty penny for sure, but literally putting an expert in charge of working up the party mood of your guests could be worth it. Note: You’ll definitely want to do your research first, because having a DJ that wants to turn your wedding into a Euro Haus club event when that’s not what you want would be a little bit of a nightmare. Now let’s here it from y’all. What are your plans for wedding DIY? And for those of you already hitched, What WEDDING DIY CHOICES DID YOU MAKE? What didn’t you? And if you had to do it all over again, would you DIY the same things, or not?